Whether it’s a baby shower, anniversary, wedding or other celebration, why not consider a pull up banner to announce the occasion? Banners Perth is fully stocked with banner material, ready to go, meaning you’re able to get your special occasion banners very quickly. Our in-house production means we have full control over the entire process, and you can be sure of a quality result. 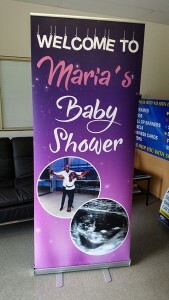 Seen above is a pull up banner we made for Maria’s baby shower. She was over the moon with our quick turnaround and excellent pricing, and we’re sure you will be too. If you have a special occasion which you’d like to promote or have seen, then click on our contact page to ask us more. This entry was posted in Pull Up Banners and tagged Anniversary Banner, Baby Shower Banner, Special Occasion Banners, Wedding Banner by Banners Perth Staff. Bookmark the permalink.